Without a ball, there is no game. You need quality baseballs or softballs whether you're playing a tournament or playing in your backyard. We have several to choose from, and if you are unsure which to choose or just want a guaranteed winner, you can't go wrong with any of these. It can seem complicated so we've decided to make it real simple. We have split our baseballs and softballs up into three categories: Good, Better, and Best. Just click the heading below for the category of ball that best fits your needs! 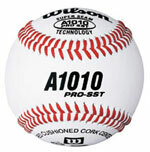 -- These baseballs are unbeatable as far as quality goes. Saying these are good is an understatement -- these balls are top-notch quality and are truly great. They are Wilson 1010S BLEM baseballs. We always joke that the blem on these balls is that they are square. The reality is the only thing making these balls "BLEM" is that they are missing the NFHS stamp. These can be used at all levels and can be used as a game ball in some leagues. Then you also have a Champion ball with the NFHS stamp. These can be used for high school games. I recommend the Champion ball for practice. -- If you want to talk about one of the highest grades of leather you can find on a ball, this is it right here. This ball is top notch and the quality cannot be taken lightly. This ball is the 1010 Pro with various conference stamps on it. All this means is that these balls were made for specific conferences and have their names printed on them. It is a tighter ball than the 1010S, and as long as you don't mind seeing something like the New Mexico conference logo on the ball, it's totally worth the money. This category also includes the 1010s Blem because they are one of the best practice balls around, and the Champion official league ball which is a great overall ball for practice. Here it is: the granddaddy of them all. This is a ball for the college ball players. This is one of the best balls you can get, made from Wilson's top-notch Grade A leather. It also has DuraCore Technology. Very durable and able to withstand a beating over time. These balls will last. --This category includes Champion softballs. They will be an all leather and come in 11 inches and 12 inches. These are a high-quality ball that will be missing the ASA stamp. A great practice ball at a great price. --In this category, we have two brands of softballs. We have a Worth ball, which is the official Little League ball, and it will be a .47 COR/375 lbs. compression, 12-inch ball. The 9031 is also a .47 core with a Compression Controlled Polycore center and has the ASA stamp on it. --This is Wilson's best softball: the 9011. It has all the bells and whistles, including the controlled center cork and Super Seam technology. The quality is top of the line. This ball has the Penn Conference stamp on it, which does not affect the ball at all. It also has the NFHS stamp on it. 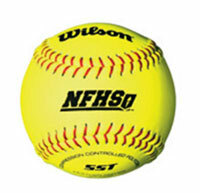 We also have top-notch Rawlings and Worth balls that have the NFHS stamp.